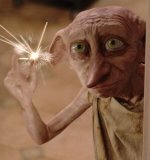 With another huge opening weekend, the second installment of the Harry Potter franchise has made it's way to screens around the world. This week's quiz is a mix of easy and hard, from the first and second movies. So don your robes, pick up your wands, and head into a chamber full of non-muggle trivia. Three of these Harry pics are from "The Sorcerer's Stone", and three are from "The Chamber of Secrets". Select the three pics of the younger Harry from the first movie. This question is worth double points!! 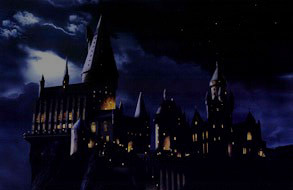 2) Select all the names of teachers we meet at Hogwarts in either the first or second movie. 6) Select all the names of balls used in Quidditch. 3) What platform did Harry have to go to, in order to get on the train to Hogwarts? 7) What was in the wand that Harry bought in Diagon's Alley? 4) What was the name of Ron's rat? 8) About how many wizard cards did Ron say he had collected from Chocolate Frog boxes, when he first met Harry on the train to Hogwarts? 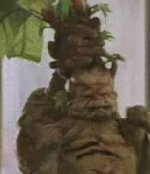 5) Which Hogwarts 'house' do Ron's older twin brothers belong to? 9) Which direction did Hagrid tap the bricks in order to open the secret gateway into Diagon's Alley in the first film? 10 - 14) Creature Conundrum! 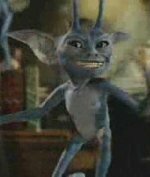 Put these creatures in the order they first appear in the two Harry Potter movies, starting from the beginning of "The Sorcerer's Stone" and going to the end of "The Chamber of Secrets"
15) What was the name of the book that Gilderoy Lockhart was pushing at the start of "The Chamber of Secrets"? 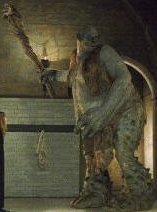 18) What molded creature was on the water faucet that was part of the entrance to the "Chamber of Secrets"? 16) What offensive word did Malfoy call Hermione in the second movie? 19 - 20) When the Quidditch scene starts in the second movie, Slytherin is shown getting a goal. The score is then updated- what was the new score at that time? 17) What did Hermione write on the bottom corner of the paper that Harry found in her petrified hand? 21) What's the name of the next Harry Potter film due out in 2004?